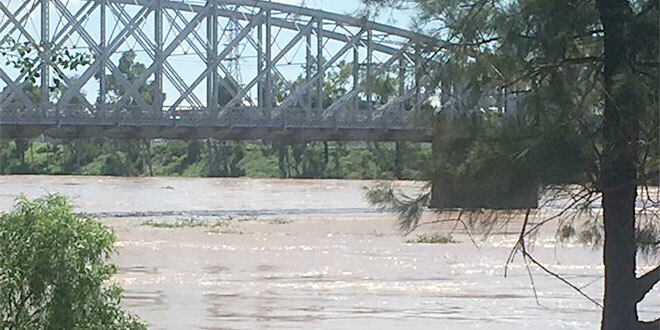 Close call: Water flowing under Neville Hewitt Bridge, Rockhampton. Photo: Supplied. ROCKHAMPTON’S bishop has praised the “extraordinary” efforts of the community preparing for an Eastertide surrounded by the worst floods since 2011. Bishop Michael McCarthy said early in the week many homes had been evacuated and were expected to be isolated as floodwaters continued to rise in the aftermath of Cyclone Debbie. The Rockhampton airport also closed at midday on Monday (April 3) and it could be a month before it reopens. “There is a little anxiety surrounding the essential service of the Royal Flying Doctor Service that flies many people to Brisbane for emergency medical treatment,” Bishop McCarthy said. The Bureau of Meteorology issued a warning for the Rockhampton region on April 3, saying a major flood peak of nine metres would likely hit the region by tomorrow. While flooding was a normal part of living in Central Queensland, Bishop McCarthy said the community was working together to minimise any damage by the floods. “As recently as 2011, Rockhampton was in flood and the memories are still with the community,” he said. “However, it is extraordinary how the community bare working together. “Already many people have moved into the showground pavilions as they have left their homes on the lower parts of the northside. “Neighbours are assisting with the filling up of sandbags. Bishop McCarthy also honoured the State Emergency Services crew and local police who “have been marvellous as they help us prepare”. “As we approach Easter, we remain in hope that the damage will be minimal and that the Risen Lord will be a comfort in this time of tragedy,” he said. Rapid flow: The railway bridge over the Fitzroy River in Rockhampton. Photo: Supplied. 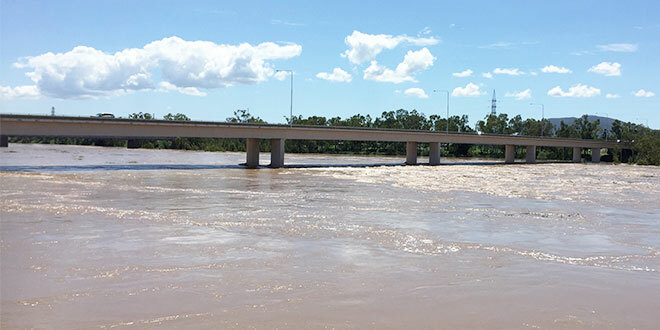 The Fitzroy River at Riverslea, Yaamba and Rockhampton continued to rise on April 3, with water levels expected to rise above the peak at all locations by the evening. “We wait and see what happens,” Bishop McCarthy said. Catholic schools in Rockhampton closed from March 28 to March 31, and are scheduled to open when Term Two begins on April 18 after the Easter break. Schools in the northern region of the diocese were most affected, and assessment for rectification work is planned for the next two weeks. The diocese’s Catholic Education director Leesa Jeffcoat said their first priority was student safety. Catholic Education was focusing on the risks and impacts of the major flooding predicted for the Fitzroy River in Rockhampton, which was not expected to impact on local Catholic schools. The sector has offered to support families who will be affected by the major flood event. “Throughout the cyclone emergency and associated weather, Rockhampton Catholic Education has worked closely with the Department of Education and Training and Emergency Services personnel,” Miss Jeffcoat said. “We are very appreciative of the timely advice and support that all State Government agencies and other authorities have provided to Catholic Education which greatly assisted our decision-making regarding the safe operation of our schools and services in Mackay, Walkerston, Sarina, Gladstone, Tannum Sands and Bundaberg.